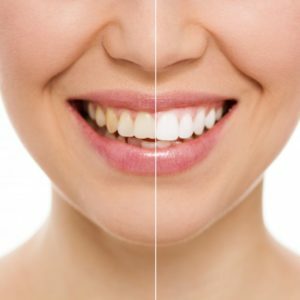 When you have troublesome stains or discoloration that can’t be removed with you daily oral hygiene practices or a dental cleaning, professional teeth whitening provides a way to realize the bright and brilliant smile you’ve always wanted. Enamel – The outer layer of your teeth is called the enamel. It is comprised of the hardest material in the human body and has the duty of protecting the sensitive inner parts of the tooth. Because it is bombarded with food, digestive acids and the overall harsh environment of your mouth, the enamel can be stained over time. Dentin – A contributor to tooth discoloration can be the dentin. This is the sensitive layer that lies beneath the enamel. Unlike the latter, the dentin contains some of the teeth’s nerves and has a yellowish hue to it. Over time, as the enamel wears and the dentin layer becomes more visible, your teeth can look yellow. Thankfully, you can enjoy a rejuvenated smile with professional teeth whitening! In-Office Whitening – For the fastest results, you can choose in-office whitening. Using only the highest quality bleaches, your cosmetic dentist will brighten your teeth up to 10 shades with the hour-long procedure. At-Home Whitening – For the most convenience, you can use the at-home whitening method. It still utilizes a professional-strength whitening gel that you’ll be given instructions on how to safely and effectively use. Unlike store-bought take-home kits, your whitening trays will be custom-designed to fit your mouth and deliver the safest and most noticeable results. Before you get started, your cosmetic dentist will thoroughly examine your teeth to make sure the dental whitening route is best suited to fit your aesthetic needs. With the expert help of your local professional, you’ll soon have beautiful teeth that leave you full of confidence and ready to show the world your new smile! A graduate of the University of Maryland School of Dentistry, Dr. William Herr is considered to be one of the top-rated dentists in Attleboro. By being trained in all areas of dentistry, he is able to deliver the best in comprehensive care, which includes teeth whitening at Capron Park Dental. To experience the smile of your dreams, contact Dr. Herr for more information through his website.